Only 9 left! This item ships in 1-2 days. It's important to keep lost loved ones close to our hearts, and when you wear this personalized memorial gift around your neck day after day, you can do just that. 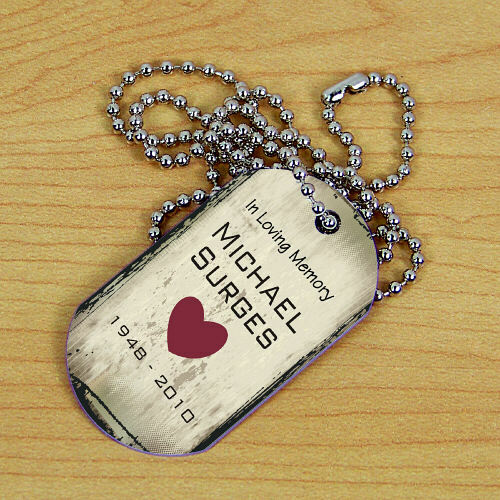 This dog tag will stay close to your heart at all times when you wear it. Free personalization of any two line message and memorial years are included. Love it! Wonderful way to Remember my loved one! Love it, brought me to tears. Could use a glossy finish option but good for the price. Additional Details Find more heartfelt sympathy gifts to keep the spirit of a lost loved one with you wherever you go.